Glucose and Sucrose Colorimetric/Fluorometric Assay Kit | K616 | BioVision, Inc.
Glucose (C₆H₁₂O₆; FW: 180.16) and sucrose (C₁₂H₂₂O₁₁; FW:342.3) are the important fuel sources to generate universal energy molecule ATP. Measurement of glucose or sucrose level can be very important in both research and development process. Sucrose is a disaccharide which can be converted into one glucose and one fructose when adding Invertase. BioVision’s Glucose and Sucrose Assay Kit provides a convenient means for measuring glucose and sucrose levels from various biological samples (e.g. 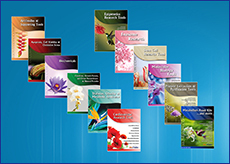 serum, plasma, body fluids, food, growth medium, etc.). To measure glucose level, glucose oxidase specifically oxidizes free-glucose generating a compound that reacts with the glucose probe to produce resorufin, which can be detected colorimetrically (O.D. 570 nm) or fluorometrically (Ex/Em 535/587). 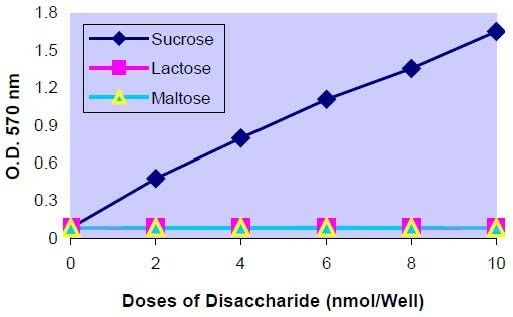 To measure sucrose, invertase can be added to the reaction to convert sucrose to free glucose and fructose, so total glucose level can be measured. Then the sucrose level = Total Glucose – Free Glucose. Should a glucose standard be prepared since the kit comes only with a Sucrose standard? This is not necessary since the invertase converts sucrose to glucose and fructose. This glucose is measured in the reaction with the probe. A separate std curve with glucose will yield identical results. Will disaccharides other than sucrose be measured by this kit? 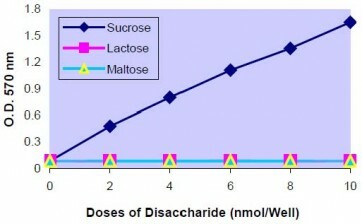 The data on the datasheet shows that other disaccharides like Lactose and Maltose do not interfere in this kit's measurements. Nedogenous glucose can generate background and needs to be subtracted using a background control.